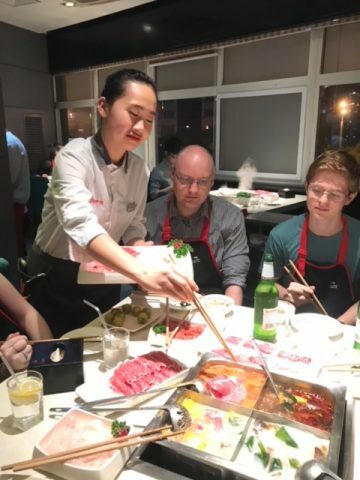 Thanks to LTL student Catherine for this great insight into the Student Life in Beijing. 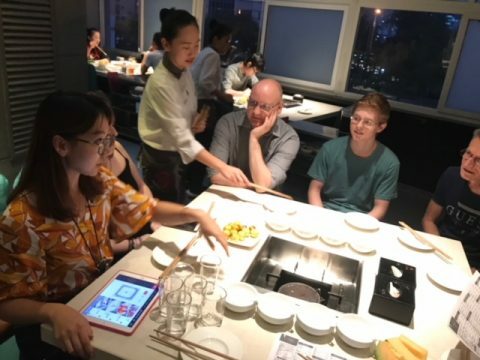 Tonight (written in September 2018), Angelina organized a group of students and staff to go out together to a near-by restaurant famous for their “Sichuan-style Hot-Pot dinner”. Sitting flush with the table and centred, four deep metal dishes welcome us, each filled with a different poaching liquid, ranging from mild to hot, kept simmering over a hidden heat source. 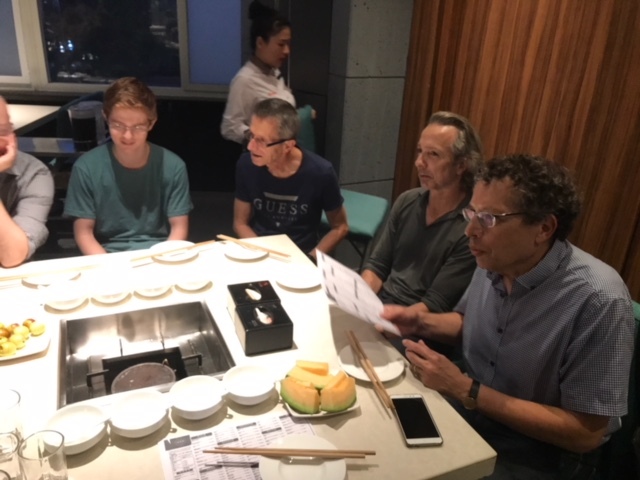 We first get up to the sauce bar and fill our individual bowl, choosing from a rich array of condiments and sauces labelled, gratefully, in Chinese and English. We settle back to our table and the feast gets started. Tray upon tray of cut meats (paper-thin beef, choice raw tri-tips, meatballs, air-dried skins, etc.) magically appear, along with cut seafood, cut veggies, fresh local Chinese noodles, cut roots (lotus etc. ), algae, tiny quail eggs, offings (tripe), radishes, several kinds of mushrooms, etc. All get thrown into the four bubbling pots, a little at a time. 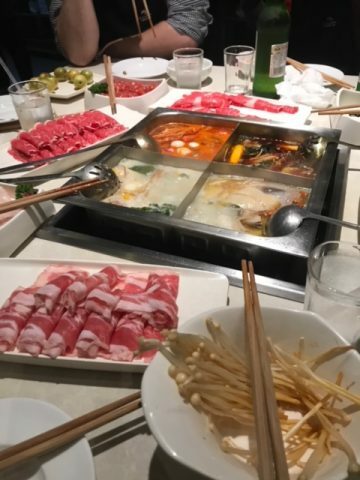 The extra-long chopsticks and small ladles make it easy to retrieve the edible treasures from the hot pots. The mix of herbs and spices is different in each pot, giving the food simmering in them a specific flavour. It is, simply put, heavenly delicious. The servers efficiently keep bringing new ingredients to throw into the four pots, until we call it quits. It took us a surprisingly long time to actually call it quits… Good students are notoriously famished all the time, right? The coup-de-grâce: upon Angelina’s discreet request, a young, agile chef comes to our table. Oblivious to the servers’ traffic and cramped space between tables, he demonstrates the art of making long wheat flour noodles. It actually is an art, with living-treasure Masters teaching their craft to long-term apprentices. Our young master starts by splitting and stretching a twenty-inch ribbon, and within twenty seconds he is twirling it into a ten-foot lasso, casually grazing my head by less than an inch! The ribbon ended up in … you guessed it! In the hot pot … and in our stomach. Add to this glorious mix a lively conversation between fellow LTL members from around the world, and you have the perfect recipe for a great evening! 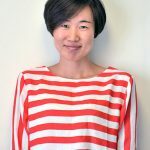 Our thanks for this blog go to Catherine von Dennefeld who we welcomed to LTL Beijing in August 0f 2018. She will continue her Chinese adventure in Chengde. Thanks Catherine!